Now, cardoons are a misunderstood vegetable. I think they are part of the artichoke family, but they look like exceptionally long, pale celery. I’ve been experimenting with my cardoon recipe and I think this is the best version, to date. Clean the cardoons by stripping them of the largest, thickest fibers that run lengthwise on the stalk. Chop into bite size pieces. Boil in salted water, with a big spoonful of flour for about 30 to 40 minutes, or until tender. Drain. 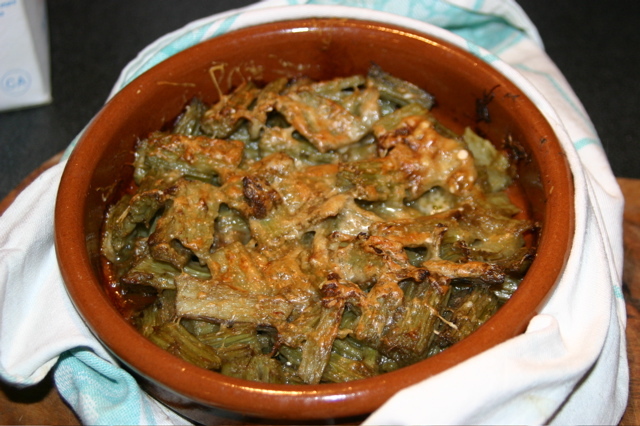 Fry the cardoon pieces for a few minutes with an anchovy, in olive oil. The anchovy will break up and dissolve. Add a splash of white wine and a spoonful or two of chicken stock. Arrange the pieces in a baking dish, add some grated parmigiana cheese and bake a 325F for about 20 minutes, or until everything is hot and bubbly. Although 3 cooking steps is a lot, the end result is worth it. Honest!